If advocates for the late U.S. Navy man Charlie Demos Sr. hoped their lawsuit alleging mismanagement at the Boulder City Veterans Home was going to cause a stir among elected officials who love to make political hay of their support for the military, so far they’ve been mistaken. 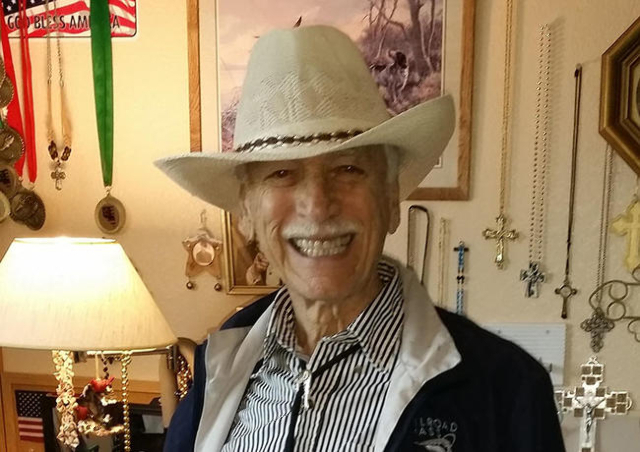 Charlie Demos Sr., is shown in happier days in his room at Boulder City Veterans Home. The veterans home has its defenders, but it also has generated scrutiny separate and apart from the Demos lawsuit, which was filed last month in District Court in the wake of the elderly veteran’s April 2015 death related to Legionnaire’s Disease. An inquiry by the Southern Nevada Health District found the presence of legionella bacteria in the facility — including in Demos’ room. The report went on to state that “based on these results, the presence of Legionella pneumophilia in the water system may pose a health threat to residents and staff. As such, this finding should be immediately addressed to ensure that the disease causing organism is appropriately removed from the water system.” A state director with supervision over the retirement home defended the facility and downplayed the issue. Through attorney Martin Little, the Demos family complaint and class action accuses Nevada Department of Veteran Services Administrator Mark McBride of failing to “implement a proper program for the prevention, detection, or control of legionella bacteria and the prevention of Legionnaires’ Disease. In recent years, a resident suffered heatstroke and sun-related blistering after being allowed to remain outside on a hot summer day. The resident, eventually identified as former Nevada legislator Bob Robinson, later died of sepsis and other medical issues related to heatstroke. Other inspections have focused on the level and quality of nursing care available at the facility. A pattern emerges that points to a lack of staffing and highly qualified personnel. And the problem only figures to increase in the coming years as Nevada’s veteran population, estimated at nearly 350,000, continues to grow. Among several key challenges: increasing available bed space while improving living conditions for aging veterans. That takes more than money. It also demands that members of Nevada’s congressional delegation keep their eye on the ball and exercise their political will. Although the nursing home isn’t in her district, Rep. Dina Titus, D-Nev., is a member of the House Committee on Veterans Affairs. Her work in 2015 to secure millions in funding for homeless veterans was laudable. And Rep. Joe Heck, R-Nev., goes to great lengths on his official websites to show his affinity for veterans. A physician, Heck often mentions his status as a veteran whether he’s on the floor of Congress or on the stump back home. But it appears residents of Southern Nevada’s veterans nursing facility need more help than they’re receiving. It’s becoming increasingly clear that the Boulder City Veterans Home may require increased scrutiny to meet quality assurance goals, but the health and dignity of its residents demands that greater resources be invested in order to keep the promise our society has made to our military men and women. If the Demos lawsuit helps accomplish that much, it will have done its namesake proud. John L. Smith’s column appears Sunday, Tuesday, Wednesday, Friday, and Saturday. Contact him at 702-383-0295 or jsmith@reviewjournal.com. On Twitter: @jlnevadasmith.